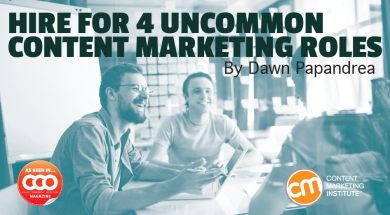 We connected with thought leaders to talk about their content marketing hiring wish lists. Here are four of the uncommon positions they have or would like to have on their teams. This article originally appeared in the June issue of Chief Content Officer. Sign up to receive your free subscription to our bimonthly print magazine. Dawn Papandrea is a freelance writer based in Staten Island, New York, specializing in content marketing, personal finance, and higher education. She's a regular contributor to NewsCred (a CMI benefactor), in which she covers the digital marketing industry. Her work has also appeared in national publications and websites including Family Circle, Parents, WomansDay.com, CreditCards.com, and many others.